Had chance for a little play this afternoon so I've made a card for the Less is More Challenge week 185 where the theme is ANIMALS. Well I don't have many animal stamps at all so thought I'd use this deer/reindeer stamp from Crafty Individuals (CI-332). I've stamped him with Onyx Black Versafine and then watercoloured him with Aquash. I got a bit carried away with his red nose....he now has a red muzzle!! I just matted him on red card to match his nose and then mounted it over a spray of Snowflakes (Oak House Studio) inked in Powder Blue Pigment Ink. A quick and simple Christmas card with the addition of a sentiment at a later date. Thanks for visiting and for your comments - they are much appreciated!! Great festive theme with your reindeer ....... does he have a red nose too? Great card ! Oooh a stunning Mr reindeer and well done on getting organised with a Christmas make. Makes me feel I should be making Christmas cards Elaine! 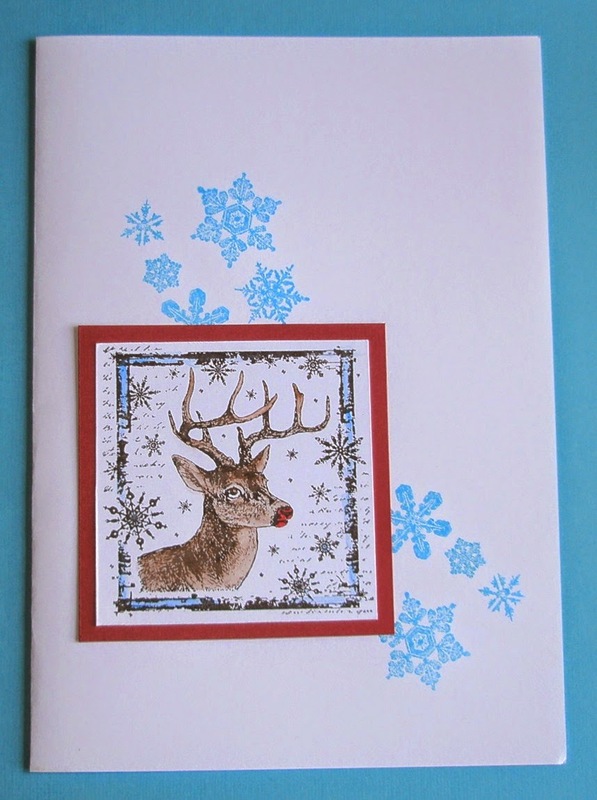 A fabulous Christmas card Elaine, I love your design and colour scheme - your reindeer panel is just adorable!! What a fab reindeer Elaine! Thank you for joining this week's Less is More Challenge, animals.